This week is Holy Week for western Christians. Today, on Good Friday or Great Friday, girls are very busy in the kitchen. Cooking, baking and egg painting for the family and friends are all our tasks and sometimes they can be fun, until it come to do the dishes. With my laptop in the kitchen I'm trying to craft an Easter greeting card for you but there is nothing in the kitchen to inspire me; flowers and food don't always mix. 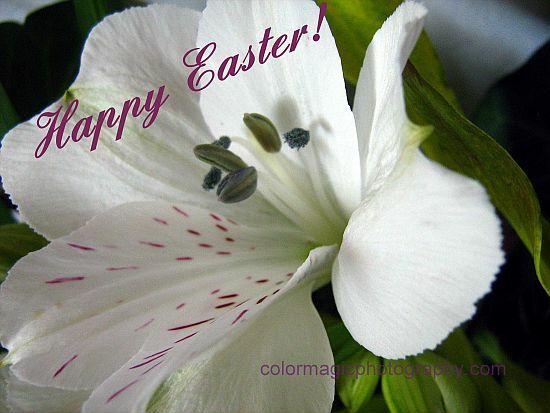 With this white Alstroemeria macro I wish you all a Happy Easter holidays with your family. hi Maia! there was no linky earlier. thanks for the heads-up. That's not possible Luna, the linky is included in the post when I publish it. Please, leave your links in the linky list not in the comment box. I delete all comments with links. Happy Easter! Beautiful flower! Your photo is pretty, soft as silk! It worked for me, your flower, is ordinarily called lily? Hope you and your family have a wonderful Easter weekend. AMEI AS FLORES! BOA PÁSCOA A TODOS!